I've released a new version of XPages For Connections (direct download). XPages can be used to extend IBM Lotus Connections. Previously I've shown how to put XPages on the Updates and Widgets home pages in Connections. You can also use XPages on profile and community pages. In order to do this you need to get the context, e.g. the displayed user name or community name. Since XPages run in iFrames you need to use the context.getComponentParameter methods like context.getComponentParameter("profileDisplayedUserUID"). The following screenshot shows how to extend a Connections profile via XPages. 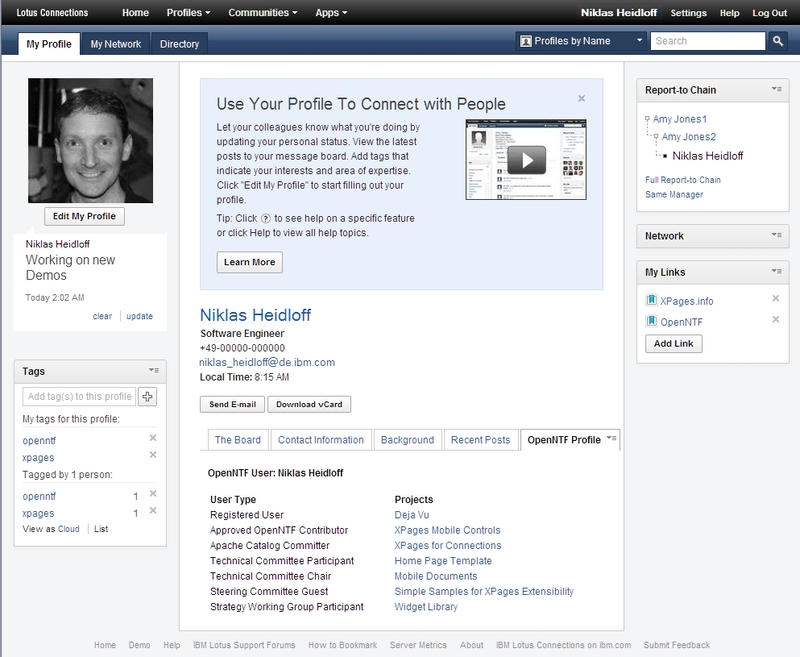 The OpenNTF user profile of the displayed user is shown in a new tab at the bottom.